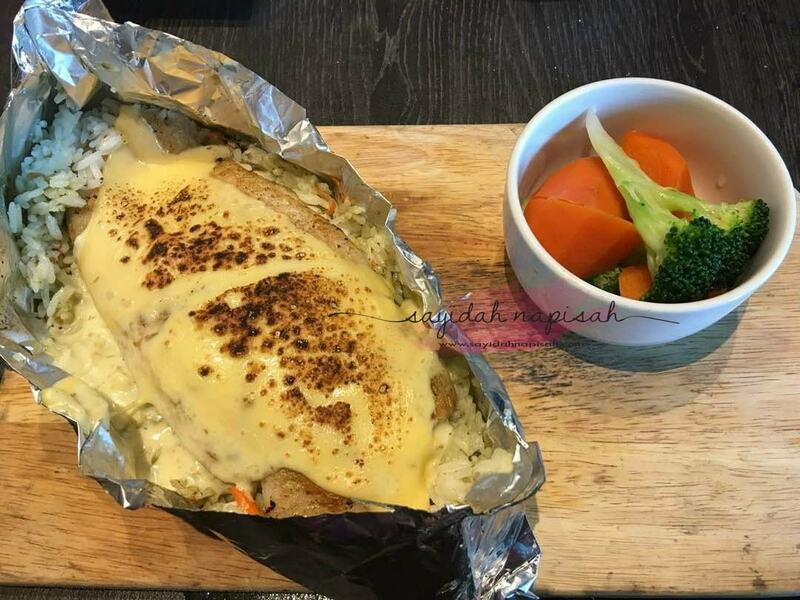 menu The Manhattan Fish Market: Flaming Cheesy Baked Rice - clear the docks and make room for a satisfying flame-grilled cheeesy dory fillet on a bed of Coriander and Rosemary Herb rice. RM26.90 | this is my menu yang saya order. tapi saya just makan nasi dia je sebab tak berapa gemar dory cheese tu. 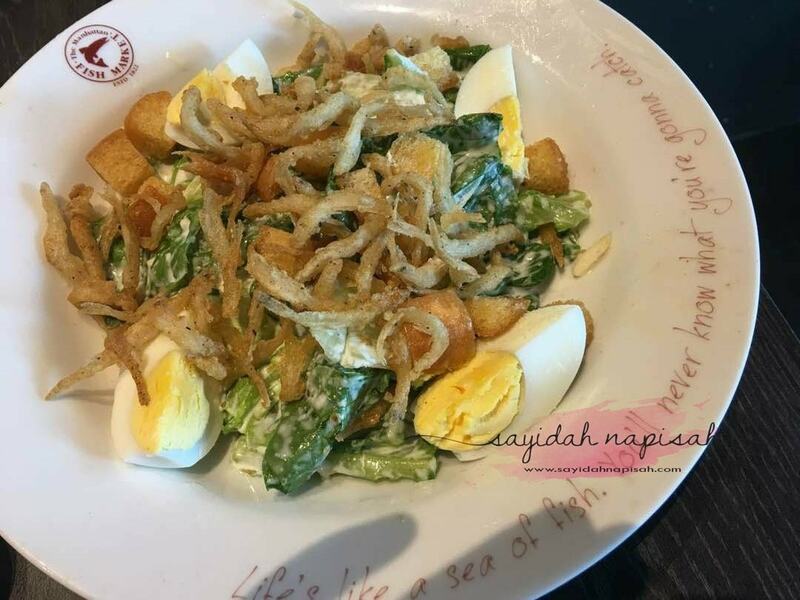 menu The Manhattan Fish Market: Caesar Salad with Whitebait - crispy golden whitebait flakes on a bed of Caesar salad. Have it as a complete meal or share it with your friends as s starter. RM22.50 | disebabkan saya tak berapa suka sayur, so saya tak sentuh langsung menu ni hahahaha. umi suka sangat salad ni. sedap katanya. 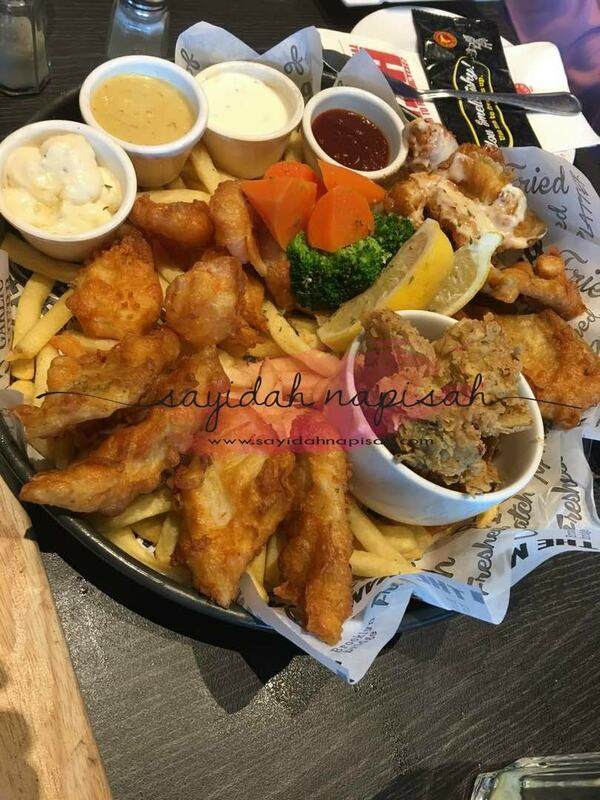 menu The Manhattan Fish Market: Fried Giant - strike gold with this platter of crunchy prawns, crispy fish fingers, cherry snapper fillets, battered onion strips and calamari coated with crushed peanuts. Enjoy it all with a selection of dips -Cajun Honey Mustard, Smoky Chipote, Tartar and Onion Glory Dip. 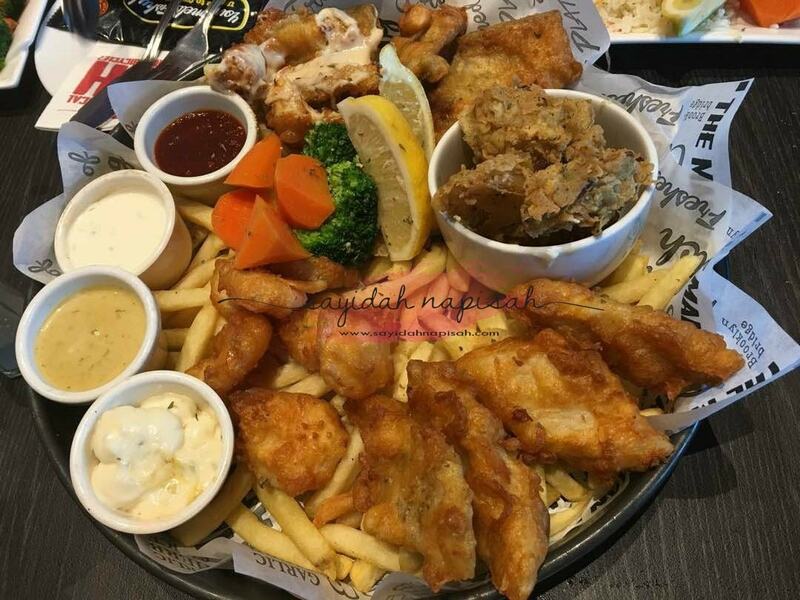 RM71.50 | saya suka fries & udang je hahaha. yang lain saya kureng. tapi alang, umi and abi suka je. just not my taste. 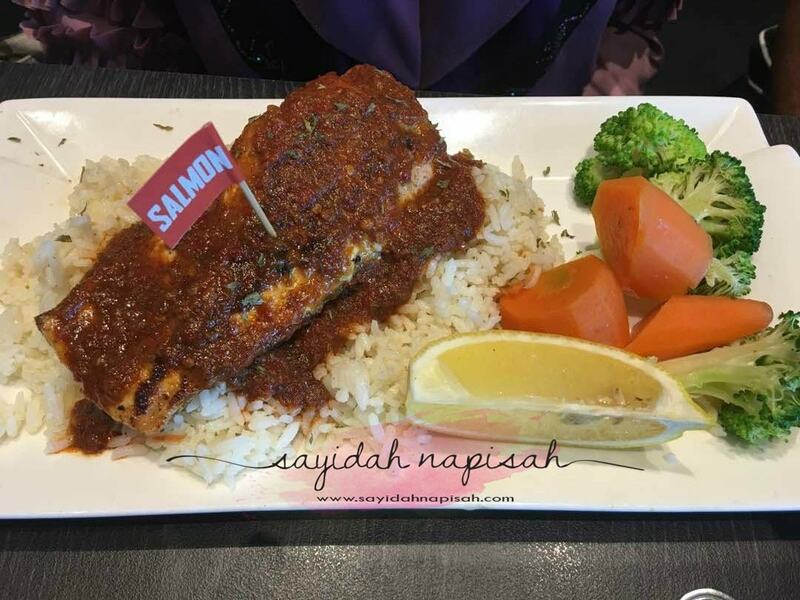 menu The Manhattan Fish Market: Mediterranean Baked Salmon - the hot favorite for the ladies, we love this dory fillet/ salmon baked in flavorful blend of spices and herbs, served with Garlic Herb rice and veggies. 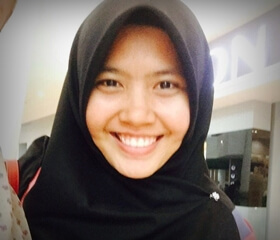 | rasa dia not bad. sedap jugak. 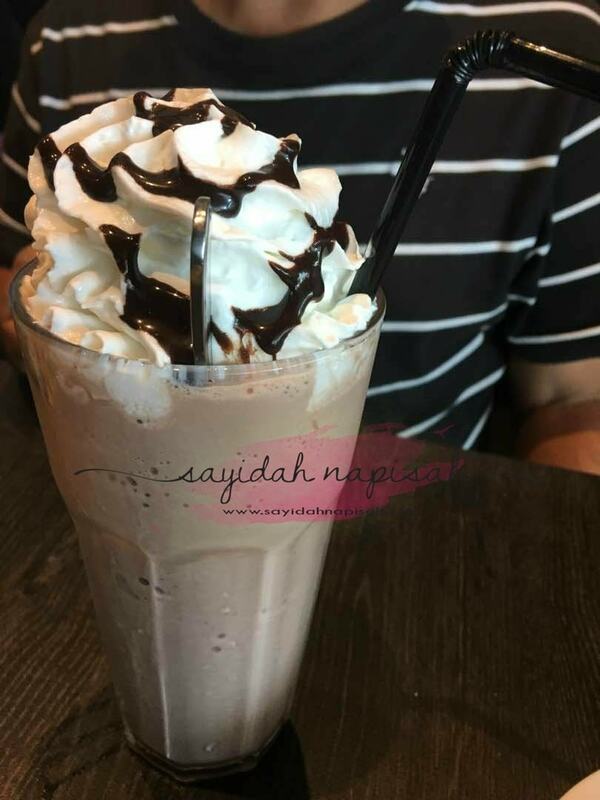 menu The Manhattan Fish Market: Chocolate Milkshake - creamy and totally indulgent sheer bliss to all chocolate lovers! 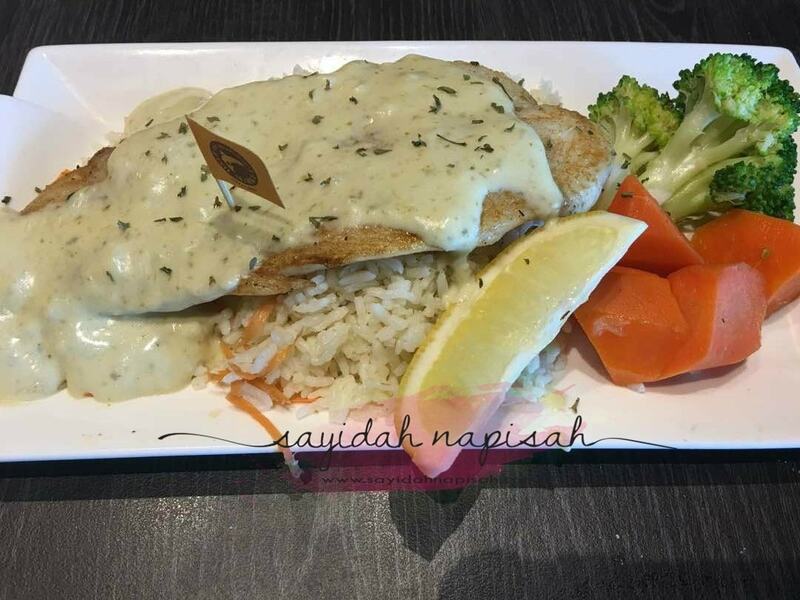 RM13.50 | SERIUS SEDAP! Kundas dan Kuah Kacang di Kuala Kangsar, first time cuba! Cheese Topokki di Sopoong IOI City Mall terbaikk! Menu di Cendol Retro Paroi, Seremban menggiurkan!